The Lexus Power of h campaign has been going strong since 2008. I’ve always loved the idea of Lexus owning a letter of the alphabet; it is a great way to define the campaign in a simple, easy to comprehend manner plus it gives the brand a way to show it is an early adopter in the hybrid space, in the same way someone gets an email address like "chris@yahoo.com" or "@Justin" on Twitter. It shows they were there before everyone else. Lexus’ new ad campaign highlights their first mover advantage by positioning their luxury hybrid products in the total miles and vehicles built while their competitors are just beginning to come to market. With Lincoln, Infiniti and many others to enter the luxury hybrid segment, now is the time for Lexus to show their experience and the TV spots do that very well. 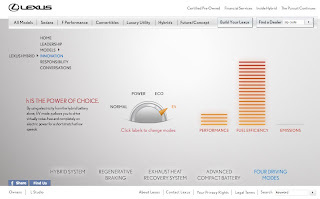 The Power of h campaign also received a newly designed web experience that uses interactive demonstrations that teach more about the hybrid and green technologies found on Lexus vehicles. The site’s primary content areas are Innovation, Responsibility, and Conversations. The Innovations section talks about the technology benefits to the overall hybrid message. Users can see how different technologies impact fuel economy and better use energy in the vehicle. Responsibility content communicates the ecological impact of the Lexus vehicles on our ecosystem, providing information about recycling, reducing waste, and even some cradle-to-cradle approaches to design. The Conversations area houses video content that talks about different ecological actions that have less to do with hybrid cars, but is rather a way to associate the Lexus brand with green thinking. Most of the videos showcase green engineering examples to create a better world. The content is very interesting and demonstrates a true respect for the environmental movement. As part of the Lexus 250hs launch, Lexus marketed to a group of video developers in a contest to create Viewer Created Ad Messages (VCAM) -- user generated video content developed by the community at Current TV. Typically this kind of content gets relegated to a YouTube channel or stays within the community it was created in, but Lexus brought the user generated videos into the new hybrid site under the aptly named “Conversations” navigational link. It’s a great example of how to extend user generated content into a larger campaign and by using Current TV members they attracted a group who semi-pro to professional videographers, which increased the quality of the content generated. Overall the new Power of h campaign has some great messaging, an engaging web experience, and showcases user generated content in a way that is perfectly integrated into the work. None of this should come as a surprise as Lexus has set the bar for hybrid marketing.